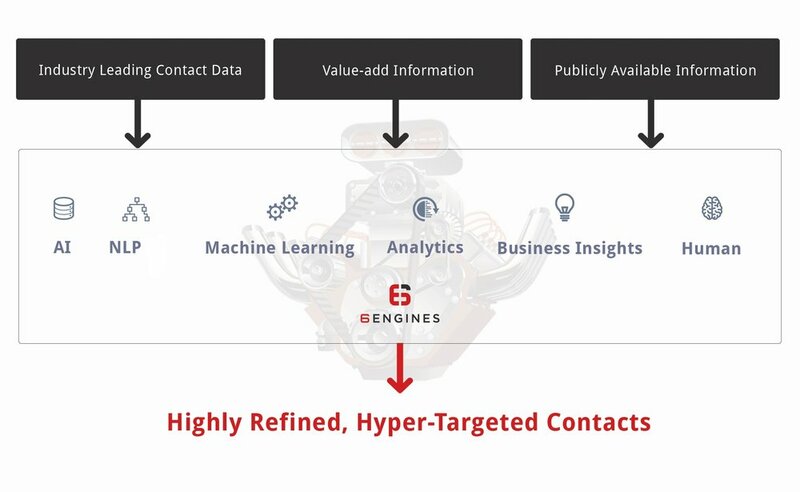 6 Engines leverages multiple industry-leading data sources and its powerful 6 step process to produce the most hyper-targeted email prospecting list, period. 6 Engines builds highly targeted prospecting lists for CEOs, Marketers and Salespeople to dramatically increase productivity in fund-raising, prospecting and lead generation. Our proprietary technologies collate large amounts of information scattered over the internet and combines that with world-class proprietary databases to identify organizations and contacts that fit your precise definition. We provide the most current and accurate contact data to help you reach new leads with knowledge, confidence, and efficiency.